Dedicated servers are sometimes provisioned manually which means these can take up to 48 hours to be fully accessible. However, a majority of our stock is available to be deployed within 1 hour or less. You can start the process of ordering a dedicated server my navigating to the ‘Dedicated’ tab then ‘Deploy’ or my clicking ‘Deploy’ on the main login page. You will be given a choice to deploy a dedicated server or a cloud server, cloud services may require you to contact our staff for verification, click here for more information. The first setup is to select the dedicated machine specifications. All of our plans are laid out on the page from highest price to the lowest. Once you have chosen the machine click ‘Select’ to progress onto the configuration. A hostname will need to specified, this is useful for you if it is identifiable and relates to the purpose. Hostnames will need to be four characters or longer to be able to complete the order. Next will be the choice of which operating system you would like on your dedicated machine. We have a range of default operating systems and software packages to be installed by default. Please note: You can change the operating system at a later data if you choose too. 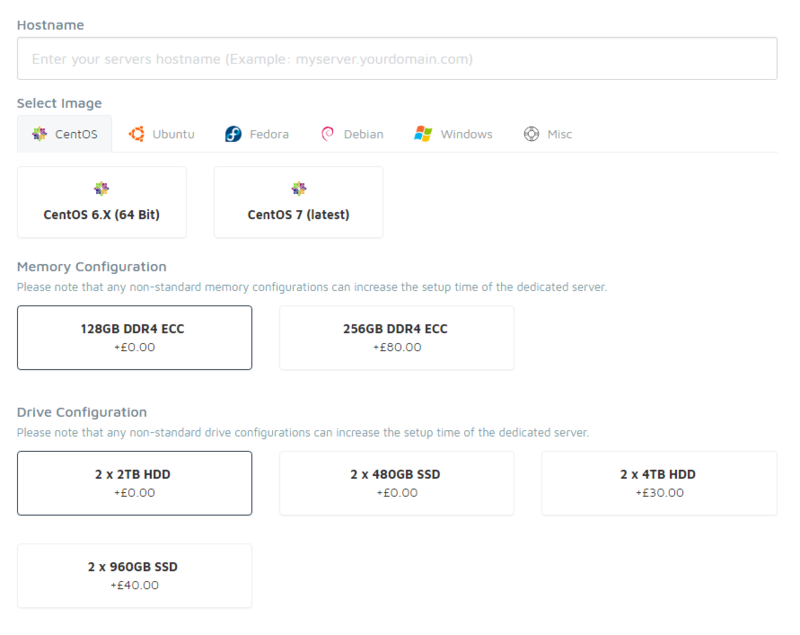 You will now need to select your memory and drive configuration's for your server. If none of the options meet your needs then please put a ticket here and one of our staff team should be able to accomdate you. Now you need to select the number of IP addresses that you would like, along with your monthly bandwith limit. Both of these can be changed at a later date. Any additional information can be entered in the next box. For example special instruction notes for our staff, such as specific drive partitions. Please note: RIPE Justification might be required for the use of additional IP addresses. 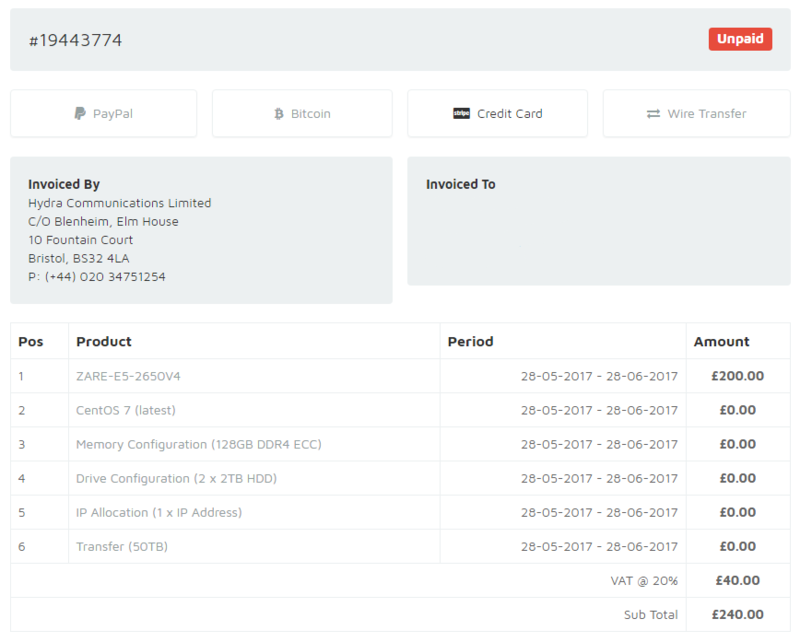 You can then click ‘Complete Order’, lots of payment options will be displayed for you to choose from and an invoice will be generated and sent via email. Once we receive the first invoice payment we will begin to set up the machine. Once we have setup the dedicated machine you should receive connection information to the email associated with your account. This will include information such as root passwords and IP addresses. Once it is setup SSH may take 5-10 minutes to become active.